Recipes Cooking with instructions to facilitate your life. Step by step very well explained. "This pumpkin roll is filled with a creamy peanut butter spread, and is topped with a caramel sauce before serving." Cake: Preheat oven to 375 degrees F. Sift powdered sugar generously over a 12 x 17-inch area of a clean thin kitchen towel. Spray a 10 x 15-inch jelly roll pan with a no-stick spray with flour; line with waxed or parchment paper. Spray wax paper with no-stick spray with flour. Beat eggs in mixing bowl with electric mixer, gradually beat in sugar, pumpkin, spices, baking powder, soda and flour, scraping bowl between additions. Spread batter evenly into pan. Bake for 10 to 13 minutes or until toothpick is clean. Loosen the cake edges immediately and invert cake onto the prepared towel. Carefully remove paper. Roll the cake beginning at the narrow end. Cool on wire rack for 45 minutes. Filling: Beat cream cheese, powdered sugar, peanut butter, and extract in a medium bowl until well combined. Unroll cake; spread peanut butter cream evenly to edges of cake. Roll cake; wrap in plastic wrap and refrigerate several hours before serving. Before serving, drizzle with caramel syrup and chopped peanuts. To this syrup be perfect, the secret is to use cream of the milk box. This trick makes all difference in this recipe. 1. In a saucepan add the sugar with water. Mix with the index finger until the sugar has dissolved and not leave glue on the sides of the pan. 2. Mild to medium fire (do not put your finger more!) And let cook, without stirring, for about 10 minutes, or until it is with an amber color. 3. Reduce the fire down and add the cream little by little. Let cook for another 1 or 2 minutes, until the syrup is homogeneous. Serve hot or cold. This lasts until syrup a week in the refrigerator, provided it is stored in a container with lid. Before serving, you can heat it in microwave for a few seconds. In small bowl, stir together all ingredients for Dijon mustard blend. Place steaks on grill over medium heat, brushing with mustard blend on each side while cooking. Cook approximately 8 to 12 minutes for medium rare to medium doneness. Serving Suggestions: Serve with grilled corn on the cob. Try squeezing fresh lime juice over the corn and sprinkle it with chili powder and black pepper. 1 - Whisk together the mayonnaise, sour cream, lemon juice, and dill. 2 - Toss in the chicken, grapes, almonds, and scallions. Mix well. Check seasonings. 3 - Refrigerate for at least 30 minutes. 4 - Serve cold over lettuce leaves. Wonderful Summer lunch idea! Serve on toasted wheat bread with tomato and a pickle for a nice deli-style touch! Careful with the Lemon Juice, too much and you'll ruin the nice combination of flavors! 1 - In a large bowl, using an electric mixer set on medium speed, beat the butter and sugar until light and fluffy. 2 - Beat in egg, vanilla, and lemon peel. On low speed, gradually beat in the flour until blended. Shape dough into a disk and then wrap in plastic wrap. Chill for one hour. 3 - Preheat oven to 350° and lightly grease two baking sheets. 4 - On a floured surface, using a floured rolling pin, roll dough out to ⅛ inch thickness. Using the template, cut out the cookies. 5 - Place cookies, 1 inch apart, on the prepared baking sheets. Make a hole in the bottom of each cookie (in the end of the light bulb) with the straw. 6 - Bake cookies in batches, until golden, about 5-8 minutes a batch. Transfer cookies to wire racks and cool completely. 7 - For the Icing: beat together confectioners' sugar and milk until smooth. Divide mixture evenly among the three small bowls, reserving about 1 cup of the mixture for the white icing. 8 - Add food coloring to each bowl to make desired colors (remember: green and yellow make blue!). 9 - Spread the different colored icings on the cookies on the bulb, let stand until set. 10 - Using a pastry bag and a small, round tip, pipe the white icing "threads" on the bottom of each bulb. Let stand until set. 11 - Thread the licorice "wire" through the hole made with the straw and string together! Christmas Light Cookies are a great gift idea. These decadent treats add fun to any gift basket! A dinner host would surely love the personal touches and not soon forget you gave them a thoughtful thank you gift basket! 1. Cut beef steak into 1-1/4-inch pieces. Combine seasoning ingredients in large bowl. Add beef, mushrooms and bell pepper pieces; toss to coat. 2. Alternately thread beef and vegetable pieces evenly onto eight 12-inch metal skewers, leaving small spaces between pieces. 3. Place kabobs on grid over medium, ash-covered coals. Grill kabobs, covered, 7 to 9 minutes (over medium heat on preheated gas grill, covered, 9 to 11 minutes) for medium rare (145°F) to medium (160°F) doneness, turning once. Season kabobs with salt, as desired. 4. Meanwhile combine sauce ingredients in small bowl. Serve with kabobs. The meat, when done well, are always very appreciated, regardless of the type and form of preparation. 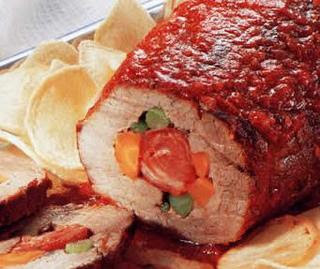 And when stuffed become even more attractive and tasty, and sophisticated for any party or occasion. The filling can make any meat dish a simple elegant and refined. Try this delicious recipe for preparing meat and packed Lizard like family and friends. First open the flesh, to look like a great steak. Then heat the wine and it dissolves the slabs of meat broth. Then pour this liquid over the meat of wine with broth, rubbing on both sides of the meat. Filled with salami, or other filling of preference, and wrap and tie the ends of the meat with string. In a saucepan heat the oil and place the meat leaving gild from all sides. Then put a cup of water and let it boil. When you begin to boil to enter the pressure cooker, cover and let cook for about an hour, always checking if there is a need for more water. Take the mystery out of carving that bird. Carving a turkey can make even the most accomplished home cooks nervous. 1. First of all, don't get bogged down by trying to carve tableside. Though a common tradition in many families, it's perfectly fine to carve the turkey in the kitchen and bring the arranged platter to the table. This especially holds true if you're a novice at carving. Use a carving knife or a chef's knife. The longer the knife, the better it will work, as a long, smooth slicing motion will make for better slices. We used a long carving knife with oval indentations along the blade to reduce friction. 2. Remove the drumsticks and thighs. Start by pulling a drumstick away from the bird and using the knife to disconnect the thigh bone from the body. Set it aside to carve later, and remove the second drumstick. 3. Remove the wings in the same fashion to fully expose the breast for carving. The wings on modern, commercial birds contain very little meat, so they're often used mainly for presentation on the platter. 4. 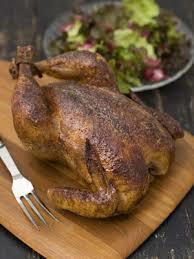 To carve the bird, make sure it's lying on its back, breast-side up. Begin with a long horizontal cut at the base of the breast. You might be able to feel where the breast meat ends and the bone begins--cut as close to that area as you can. 5. Begin slicing the breast from the top down, working at a slight angle to cut away from the carcass. The horizontal cut at the bottom provides a convenient stopping point, making it easy to finish each cut. Transfer slices to a warmed serving platter. 6. To carve a drumstick, hold one end and slice off one side. Lay it flat on the cutting board and continue carving. Slice each side, turning the drumstick a quarter turn until you've removed all the meat. 7. Place the thigh on the cutting board and begin slicing parallel to the thigh bone. Cut into even strips. 8. Arrange the rest of the meat onto the warmed platter and serve.